You are here: SAU Home / Academics / Science / Nursing / Simulation Center / What is Simulation? Simulation is a controlled, safe environment where learners can train without the risk of harm through the use of high-fidelity simulators (HFS). High-fidelity patient simulators are full-body, interactive mannequins of various ages and gender that respond physiologically to interventions. Each learner has the opportunity to experience a variety of scenarios that realistically place the learner in situations faced in a true-life environment. Each simulated experience is tailored by the simulation center team to the learning goals identified for each learner. 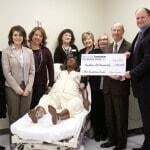 Whether managing a high-risk obstetrical delivery for a medical student or renewing certification in basic life support for a group of local elementary school teachers, the Health Sciences Simulation Center provides an avenue to improve health practices among a vast range of individuals in the region. Bridge the gap that exists between theory and evidence-based clinical practice. Prepare new graduates for clinical practice. Address the clinical site shortage most nursing programs face. Embrace all types of learners in this technology-driven society with an evolving healthcare system. Provide learners with experience that may not occur in the clinical setting. Scholarly research supports time spent in simulation enhances clinical reasoning, critical thinking, knowledge retention, and skill acquisition. Experiential learning takes place when students are confronted with unfamiliar conditions in a real-world environment that challenge them to identify what they already know, what they need to learn in order to modify or expand their existing understanding, how to acquire new knowledge, and how to apply what they have learned in different contexts.